Dec 19, 2016 – TORRANCE, Calif.
As owners of the 2017 Acura NSX begin taking delivery across the U.S., Acura has revealed a new campaign – “NSX Originals” – that brings each unique, built-to-order supercar to life in a customized, digital film. Owners will begin receiving their custom films today. “The Acura NSX is a bespoke supercar inspired by an original concept, and this campaign speaks directly to that heritage,” said Jon Ikeda, vice president and general manager of Acura. The campaign was developed by mcgarrybowen London, and is one of several customized perks of NSX ownership, including a custom 1:18 scale model, again crafted with exact exterior paint color, interior scheme, and factory installed features (carbon fiber pieces, brake calipers, custom wheels, etc.) as each unique NSX. 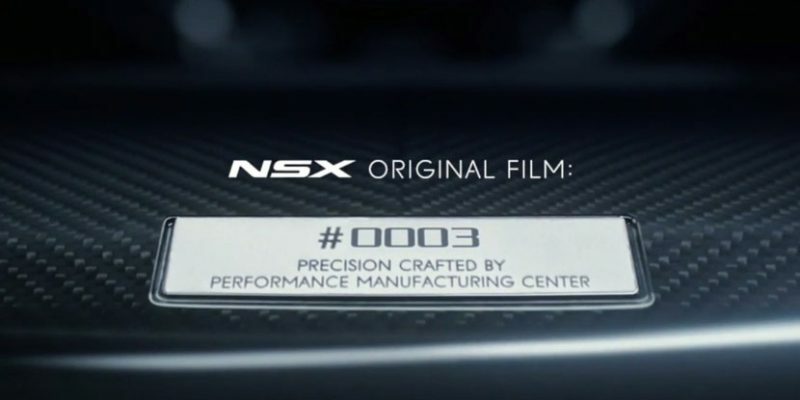 Keyed to seven unique manufacturing processes, the NSX Originals video series offers a behind-the-scenes look at the Performance Manufacturing Center in Marysville, Ohio, the exclusive manufacturing home to the next-generation NSXii. The seven processes detailed in the NSX Originals films are: Precision Robotic Weld technology, space frame construction, Zirconium Bath, state-of-the-art paint robotics, Three-Motor Sport Hybrid power unit, NSX custom hand assembly and the NSX Rolling Dynamometer. Precision Robotic Weld Technology: The aluminum-intensive, multi-material NSX space frame and body is constructed entirely in-house, using advanced robotic MIG welding to ensure the highest levels of body accuracy and rigidity to support the NSX’s incredible performance and world-class quality. Space Frame Construction: The NSX space frame uses the optimal blend of materials, including aluminum, carbon fiber and ultra-high strength steel, to deliver incredible rigidity, low weight and precision-crafted performance. Zirconium Bath: Every NSX space frame gets bathed in an environmentally friendly zirconium material that virtually eliminates waste from the coating process while protecting the aluminum-intensive structure from the elements. State-of-the-art Paint Robotics: The NSX body is painted using start-of-the-art robotics as the first step in producing a truly world-class finish. This all-glass paint booth allows customers to see their NSX body in the finishing process. Three-motor Sport Hybrid Power Unit: The NSX’s revolutionary power unit is composed of a 75-degree DOHC twin-turbocharged V6, rear Direct Drive electric motor and 9-speed Dual Clutch Transmission, and front-mounted Twin-Motor Unit. NSX Custom Hand Assembly: Each NSX is hand assembled by 16 highly skilled technicians to meticulous standards of quality at the bespoke Performance Manufacturing Center. NSX Rolling Dynamometer: Each NSX undergoes rigorous testing to verify its dynamic capabilities before it leaves the Performance Manufacturing Center, including four corner weight checks and dynamic validation of power unit and braking performance. Learn more about the NSX philosophy, technology and dynamics, and a get more detailed look inside the Performance Manufacturing Center at acura.com/NSX.